Obituary for Betty Jo (Brimhall) Cluff | Crandall Funeral Home Inc.
Betty Jo Brimhall Cluff, passed away on July 16, 2018 in South Jordan, Utah. She was born on October 26, 1924 in Idaho Falls, Idaho to Ralph and Hattie Mae Brimhall. She was the second of four children. She grew up in Evanston, Wyoming and that is where she met the love of her life Dale Cluff. They were married on December 29, 1949. Unfortunately, Dale passed away on January 20, 1979 and Betty was on her own ever since. Betty and Dale had one son Douglas Dale Cluff. She is survived by her son who lives in Salt Lake City, Utah, her granddaughter, Leanne Richardson of South Jordan, Utah, her grandson, Allen Cluff of Salt Lake City, Utah, step granddaughters, Aubrey Anderson and Alexis Hayes both of Las Vegas, NV, ex-daughter in law, Michele Karlson of Salt Lake City, Utah, her great grandson Parker Richardson, her step great granddaughter Aurora Anderson, and her dear friend, Kathy Kearney of Las Vegas, NV. Betty received her Master’s Degree in Social Work from the University of Utah. She was the head of the social work department at the Wyoming State Mental Hospital for many years. After her husband passed away she took off a couple of years and served 2 years in the Peace Corp on the island of Dominica. After her service in the Peace Corp she moved to Salt Lake City and worked in social work for the state of Utah for many years. Betty enjoyed many activities. She played clarinet in her husband’s band. She was a wonderful ballroom dancer and competed in many contests. She loved to travel and has been to every continent in the world except for Antarctica. She always loved to hike and climbed Mt. Olympus a couple of times. 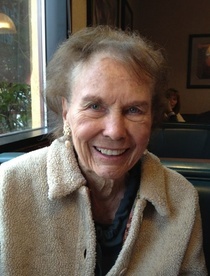 She was an avid bridge player and belonged to a bridge club for many years. She also loved to sew and was very good at it. Even in her later years she loved to play games and was a Rummikub and trivia game champion. Betty was the kindest most loving and generous person ever and was deeply loved by many. Graveside service will be held on Saturday, July 21, 2018 at 11:00 a.m. in the Evanston City Cemetery. Viewing will be at the Crandall Funeral Home on Saturday from 10:00 to 10:45 a.m.
A special thank you to Legacy of South Jordan for their wonderful friendship and care of Betty over the past 6 and a half years.